The eleventh Café Brno. Topic: Superwomen. Guests: Kateřina Falk, Markéta Veselé, and Kateřina Šedá . Host: Miriam Kolářová. 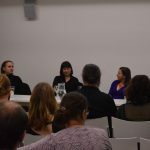 Place and time: Impact Hub, Brno, November 27, 2017. 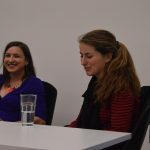 The debate were attended by: Kateřina Falk, a world-renowned physicist who studied at the prestigious Imperial College in London, studied at Oxford, and worked in the US at the famous Los Alamos National Laboratory. She is currently working on ELI Bamlines project, where she works with the most powerful laser in the world. Second guest was Kateřina Šedá, a Czech artist who graduated from the Academy of Fine Arts in Prague, she is specializing in socially tuned happenings and experiments aimed at bringing people out of stereotypes or social isolation. Last host was Markéta Veselá, who was born in Brno. She studied Architecture at Brno University of Technology. In 1995, she began postgraduate study at INEA in Rouen. She founded the Maura Architectural Practice (Ateliér Maura), where only women works. 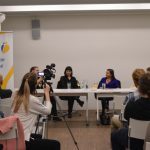 The guests discussed the situation that it is much more challenging for a woman to build career in preodminantly masculine sector. There are still prejudices against women. According to Šedá, it is sometimes an advantage to be a woman, people will at least listen to her. Veselá said in her position some men on the construction still have inappropriate comments. A large part of debate was focused on the campaign Mee to, which had recently dominated social networks. According to Falk, it is good to talk about how men behave towards women, because woman are still harassed by men and women are often afraid to talk about it.